I operate Grand Canyon Trail Guides, a small backcountry guide service which is based on the South Rim of Grand Canyon National Park. We conduct recreational backpacking programs into the inner canyon backcountry, emphasizing wilderness education, resource recognition and appreciation, and land and resource stewardship. The interpretive work places me in ongoing contact with members of the resource management, scientific research and National Park Service planning communities in our region. This often translates into administrative intrusion, bureaucratic confusion and regulatory control. Last April, however, my communications became rewarding. After a year-long correspondence with Jeff Sorensen, Nongame Wildlife Specialist with the Arizona Game & Fish Department, regarding his work in a recovery management plan for the federally listed endangered Kanab Ambersnail (KAS), I received an invitation to participate as a volunteer in a KAS riparian habitat monitoring project. 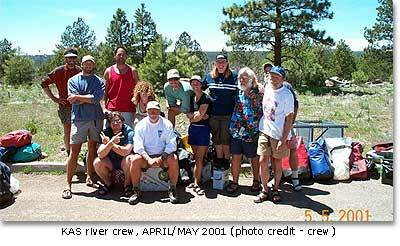 It would entail eight days of rafting on the Colorado River from Pipe Creek to Diamond Creek. The Kanab ambersnail (Oxyloma haydeni kanabensis) is thought to be a remnant invertebrate mollusk species (Succineidae) from the late Pleistocene era. It is regarded as a terrestrial snail which is primarily dependent upon wetlands vegetation, most notably native cardinal monkeyflower (Mimulus cardinalis), non-native nasturtium (Nasturtium oficianale), sedges (Carex), rushes (Juncus) and members of the cattail family (Typha). It feeds by scraping live and dead plant tissue, bacteria, algae and fungi with a specialized mouthpart called a radula, or "rasp" tongue. Typically, the snail lives approximately one year, with reproduction occurring from mid-to-late summer. Young snails hatch from egg masses containing up to 30 eggs. They are approximately 1/10th of an inch long at birth. They grow to nearly an inch by maturity. The KAS is hermaphroditic. That is, it possesses both male and female reproductive organs. Captive breeding research has indicated that the species is capable of self-fertilization even in the absence of other reproductively mature snails. With the approach of winter, the KAS enters into a specialized form of dormancy by receding into its shell and sealing itself to a dry, stable surface. While in this dormant state, which is referred to as estivation, the snail’s metabolism slows dramatically until the lengthening days and warming temperatures of spring trigger its re-emergence. Seasonal KAS surveys have indicated that over-winter mortality is high, perhaps as much as 80 percent. The population of the snail has been declining slowly for perhaps the last 10,000 to 18,000 years. The changing world climate, long-term regional drying trends, and habitat encroachment due to human development have accelerated the decline and contributed to the listing of this fragile creature as an endangered species in 1992. Since the listing, the Arizona Game & Fish Department, working with the U. S. Fish & Wildlife Service to save the species, established a captive refugium population of the snail at the Phoenix Zoo (where the captive breeding research is conducted). The purpose is not only to prevent the loss of the KAS but also to educate the public and facilitate research. The impacts of Glen Canyon Dam on the Colorado River and the downstream riparian habitats are well documented. Before construction of the dam, the river’s flow rates ranged from 1,000 to 300,000 cubic feet per second (cfs), dependent upon seasonal precipitation levels, winter snow pack and spring thaw cycles. Since construction, the release flows average around 18,000 cfs, although the flow rates may be increased on occasion to as much as 45,000 cfs or more to replenish beach heads, restore habitat and improve habitats for other threatened or endangered species. While intended to improve downstream ecosystems, the larger releases actually damage today’s KAS range and habitat by inundating and eroding away the snail’s life-sustaining vegetation and soils. Moreover, the threatened KAS is subject to natural predation by passerine birds and probably field mice, and it is vulnerable to infestation by a parasitic flatworm trematode (Leucochloridium cyanocittae). During the warmer summer months, trematode-infected snails can be recognized by the presence of the brightly colored sporocysts in their eyestalks. The sporocysts become visible by pulsating in the eyestalks, a process which may attract predatory birds, the parasite’s end-host. In 1992, when the species was added to the endangered species list, there were three known populations of the KAS. 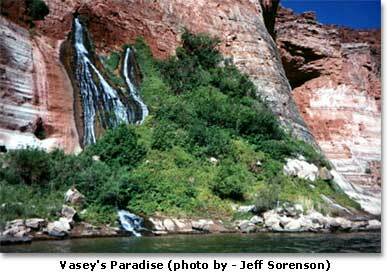 Two occurred outside of Kanab, Utah, in the area of Three Lakes Canyon, and one occurred inside the Grand Canyon National Park, at a Colorado River spring-fed tributary known as Vasey’s Paradise. Since the listing, one of the Three Lakes Canyon populations has been decimated by excessive groundwater use, and it is now believed to have been extirpated. The second Three Lakes Canyon population is located on privately deeded land which is subject to development. The national park population, which is federally protected, may have offered the only hope for the species’ survival. In 1995, the Kanab Ambersnail Recovery Program was drafted by the U. S. Fish & Wildlife Service and approved by U. S. Congress, and a statutory mandate was created to help preserve the species through habitat study, preservation and experimental translocation. 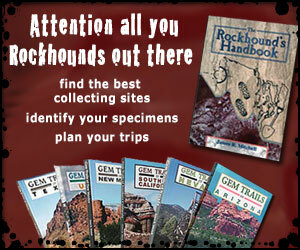 The purpose of translocation program is to create new populations in suitable habitat. It also calls for additional "seeding" with additional snails to ensure genetic diversity. Although the U. S. Fish & Wildlife Service carries the congressional mandate for Endangered Species Act enforcement, much of the legwork for compliance in the KAS program has been turned over to the Arizona Game & Fish Department. By 1997, the department completed habitat suitability studies and identified potential translocation areas. The first KAS translocations took place in 1998, when snails from the Vasey’s Paradise population were introduced to Keyhole Spring, Lower Deer Creek Spring and Upper Elves Chasm, three tributaries which enter the Colorado River within the Grand Canyon National Park. (One hundred and fifty snails were introduced at each location.) Our objective last April was to inspect the sites to determine the introduced snails had managed to survive and establish viable populations. We could have hiked down to the sites from the rim, but we could get close to them easier by river rafting, even though we still faced some hiking and even rock climbing to reach the locations. In fact, our ascent into Upper Elves Chasm required the use of rock climbing gear, including chock nuts, carabiners and static lines, to ensure group safety. Disappointingly, Keyhole Spring and Lower Deer Creek Spring proved to be a bust. The introduced KAS had apparently not survived even though the habitats appear to be perfectly suitable. These sites will be monitored in a follow-up study. By contrast, Upper Elves Chasm proved to be a success story. We discovered that the population had not only become established, it had even expanded across the creek to a location some 60 feet away, to an area we called "Melindaland" after one of our team members, Melinda Thompson.. We found, studied and documented many specimens, subsequently releasing them. The promising count not only came as a relief to the researchers, it also provided encouragement about the future success of the recovery program. The Arizona Game and Fish Department is planning a follow-up trip for the near future. With the science done for the trip, we turned our attention to the white water rafting, our way out of the canyon. Late springtime is my favorite season in Grand Canyon’s river corridor. Much of the Lower Sonoran desert environment is in bloom, and the contrast of colors is spectacular. Brittlebrush, nasturtium, monkeyflower, penstemons, toadflax, columbines, sego lily and numerous cactus species create a photogenic landscape, which is ideal for hiking, exploring, photography, sightseeing and rafting. We had undertaken the trip in four 18-foot fully framed Avon row boats, which are small enough to convey a sense of the power of the river yet stable enough to ensure the safety of the team and our truckload of gear. It is a world-class experience. Every year, some 30,000 white-water enthusiasts test the rapids, recapturing some of the adventure experienced by explorer John Wesley Powell during his epic early trips down the river in 1867 and again in 1869. Even though the Colorado River is now throttled by dams, the run through Grand Canyon can still be exhilarating and challenging. The major rapids of the Colorado’s lower half are Horn Creek, Granite, Hermit, Duebendorff, 205, 217, Crystal and Lava Falls, with the final two being considered the "granddaddies" of the white water runs. There are many more, however, and they are all fun. Wet fun. Access is difficult, however, and the terrain is unforgiving, seasonal temperature extremes can be uncomfortable, and water flows can restrict or prohibit runs. Many locations are remote, beyond ready assistance. 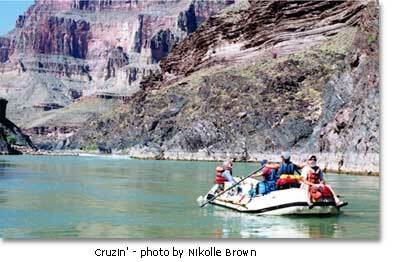 Running the Colorado River through the Grand Canyon requires special equipment, training and experience. The water releases from Glen Canyon Dam were pretty stable for our April trip, with average daily flow rates of 12,000 to 14,000 cfs. These low flows made for some interesting runs through the major rapids. We stopped upstream of all the major rapids to scout safe passage. We had the benefit of judgement honed by experience. Our tenured boatmen were Jeff Sorensen, Clay Nelson, Keith Kohl and Nels Niemi. For 61 year-old Nels, this was his 138th Colorado River run. The raft I was on bottomed-out in the Duebendorff Rapids and left us with a continual bailing chore. Later we found a small slice in the flooring beneath the framework. Two volunteers found themselves in the water (up a creek without a paddle? 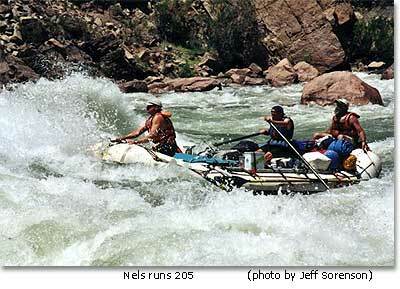 ), and they had to run Mile 217 Rapid in their personal flotation devices. They were rewarded with about 60 seconds of icy Colorado River, blue-lipped, teeth chatterin,’ adrenaline-rushin,’ wide-eyed fun that seemed more like 60 minutes. Since construction of Glen Canyon Dam, the Colorado has run a pretty stable year-round temperature of around 48 degrees Fahrenheit, cold enough to steal your breath away. As we approached the Lava Falls Rapids, we could hear in the distance its low, throaty roar. It gave us ample time to consider the potential for disaster. We scouted the run, from a high river-right pinnacle slightly upstream. Our boatmen all agreed that the standard river-right approach was appropriate. Nels made the first run. We were all sweating out a fluted lava outcrop referred to as "Cheesegrater Rock." We passed close enough to reach out and touch this landmark. It got our attention. The first wave was a standing roil nearly 12 feet high with a rolling whitecap that completely covered our raft, filling us to the brim. We had to bail hard for the next 20 minutes. Looking back, as we passed through this wavecap, I could just see Nels’ head poking poking above the wave. I could see nothing else. No boat. No rigging. No gear. No evidence whatsoever of the volunteer riding astern. Just Nels’ head. The wildest rides behind us, we pulled hard to make our take-out at Diamond Creek, rowing nearly 37 miles on our next-to-last day. We made our final camp less than a mile from take-out. The next morning, we had completed our tear down and load up by 9:30 a. m. We headed south to Flagstaff, knowing that we not only had a productive research trip but one of the best whitewater trips available in all of North America. The National Park Service has authorized 16 concessionaires to provide commercial river trips through the canyon, although reservations may already be booked up for as much as two years in advance. Each concessionaire provides its own experience, whether by motorized raft, oar boat or dory. Private trips, subject to a waiting list maintained by the National Park Service River Management Unit, have already been booked for some eight years. This is an update on the recovery actions, monitoring, and research on the endangered Kanab ambersnail in Grand Canyon National Park. Agency partners helped mitigate habitat loss for the snail at Vaseys Paradise, for both the November 2004 Beach Habitat-Building Flow and the March 2008 High Flow Experiment. The 2004 mitigation effort succeeded in fully recovering ambersnail habitat in less than 6 months, as opposed to the 2.5 years for that habitat to recover from the 1996 high flow. Unfortunately, snail counts during over the past several years are down, not only at Vaseys, but also at the translocated population at Upper Elves Chasm. Lower counts at the Elves Chasm site appear to be attributable to drier habitat and reduced springflow at their release area. However, there is some good news...recent findings from a USGS-funded study of ambersnail genetics and morphology indicate that the Vaseys population along with 11 other populations of ambersnails in southern Utah and northern Arizona are members of the same species. Additional specimens of ambersnails from the northwestern USA and Canada were also tested—the initial results indicate that our ambersnails are more widespread across North America. If “Kanab ambersnail” no longer appears to be a valid subspecies, but instead is the more common nominate species, then the interagency working group may consider petitioning for de-listing based on these new findings, once they have been peer-reviewed and published.